HARTFORD -- Tracey Scalzi spent last week walking the halls of the Capitol trying to convince legislators to save her eponymous roll-your-own cigarette shops in Norwalk and Orange. The long drive and hours for the Norwalk resident may have paid off. A bill sought by the Department of Revenue Services and Attorney General forcing around 15 tobacco shops to pay certain fees and taxes did not come up for a vote before the legislature's adjournment Wednesday. Scalzi -- whose business model relies on selling cheaper roll-your-own cigarettes -- claimed the measure would have forced her to close and layoff her 15 employees. "I have a little bit of faith in the government now," she said. "I think my message has been heard." But the matter is not concluded. Legislators plan when the General Assembly reconvenes in a few weeks to address remaining budget business to pass a measure they hope satisfies revenue services, the attorney general and smoke shops like Scalzi's. "We've come up with language that we think will, as I put it to Tracey, make her happier than she is now," said Rep. Patricia Widlitz, D-Guilford, a chairman of the Finance, Revenue and Bonding Committee. "Everyone is very sympathetic to her and it's been a difficult conversation to find the right balance, here." Scalzi's been fighting with the state since last year when DRS demanded roll-your-own shops obtain a cigarette-manufacturing license and pay the same hefty cigarette taxes levied on packaged cigarettes. 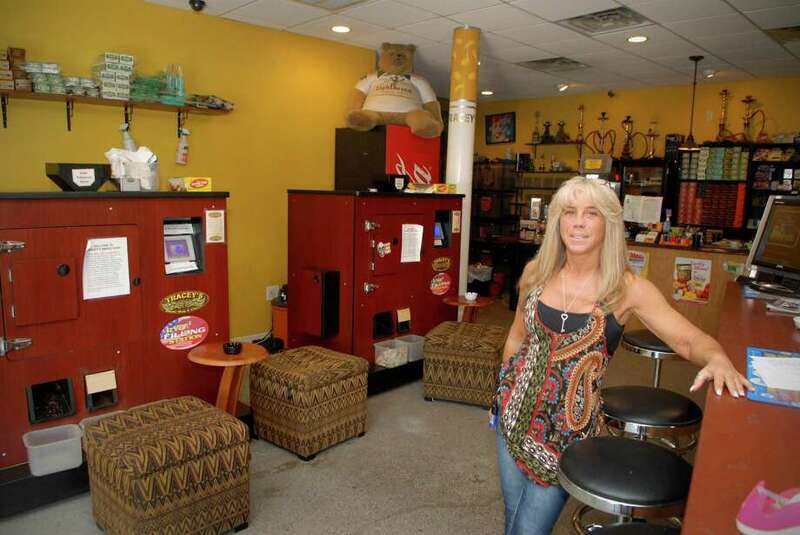 Scalzi's customers rent in-store machines to roll loose tobacco into 200 cigarettes in eight minutes, enjoying a price break over smokers who buy traditional sealed cartons. But the state argues besides not paying her fair share of taxes, Scalzi is unfairly undercutting competitors like grocery and convenience stores that charge cigarette taxes. Jepsen's office has a third concern. The Attorney General believes if the state turns a blind eye to businesses like Scalzi's Connecticut could be in violation of the 1998 multi-state tobacco settlement worth millions in annual revenues. Jepsen last week declined to elaborate, but DRS Commissioner Kevin Sullivan, Widlitz and Sen. Gayle Slossberg, D-Milford, whose district includes Orange, individually confirmed his fears. "The Attorney General's office in particular is very concerned the longer ware are in a position of noncompliance with roll-your-own the more likely it is the settlement gets to be at risk," Sullivan said at the Capitol. "That's a lot of money for the state." Sullivan and Jepsen initially sought to solve the dispute by taking Scalzi to court. But they suffered a setback in late February when a Superior Court judge concluded roll-your-own shops are not manufacturers as long as the customers are the ones operating the machines. Although the matter is under appeal, Sullivan turned to Widlitz's finance committee, asking legislators to pass a statute forcing Scalzi and other roll-your-own shops to do what the court so far has not. The judge's ruling coupled with the fact the bill was drafted after the committee's public hearing deadline gave many legislators pause. "Anytime there isn't a public hearing that raises some questions," said Slossberg. Scalzi said she is not sure what solution the legislature will come up with in the coming weeks but remains optimistic. "I'm taking Representative Widlitz at her word and believe she is a lady of her word," Scalzi said. "If she tells me 'you'll be okay' I believe I'll be okay." But Widlitz also indicated the solution may not necessarily be everything Scalzi hopes for. "It's not our goal to harm people who are in business, especially small business people," Widlitz said. "(But) it's not just about her. It's also about all the people she's undercutting by selling them (cigarettes) under-priced."